The current wave of innovation is resulting in some magical technological advancements. 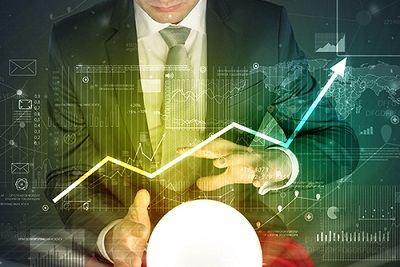 Fortunately, investors seeking to gain exposure to companies leading this wave of innovation can now access the Horizons Industry 4.0 Index ETF, which trades on the Toronto Stock Exchange under the ticker symbol “FOUR”. FOUR is a new-technology-focused exchange traded fund (“ETF”) that seeks to invest in sectors that will be crucial to the development of the Fourth Industrial Revolution, or “Industry 4.0”. FOUR seeks to replicate, to the extent possible, the performance of the Solactive Industry 4.0 Index (the “Index”), net of expenses. The Index is designed to provide exposure to the performance of companies that are advancing Industry 4.0 – the merging of the physical and digital worlds amid the newest phase of industrialization. 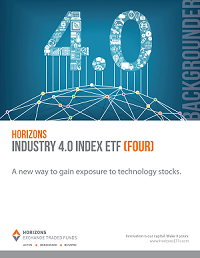 To learn about this new, innovative ETF and Industry 4.0, download Horizons ETFs’ backgrounder. Click here to check out the Horizons Industry 4.0 Index ETF Webinar.